Philanthropic arm of SIS fundraises for medical humanitarian organization through creation and donations linked to calendar featuring dogs of SIS employees. Alpharetta, GA – December 5, 2018 – Surgical Information Systems (SIS), an industry leader focused exclusively on delivering surgical information technology (IT) to ambulatory surgery centers (ASCs) and hospitals, is pleased to announce that its philanthropic arm, SIS Cares, is supporting the lifesaving work of Doctors Without Borders with the 2019 "Dogs of SIS" calendar. To develop the calendar, SIS employees were invited to submit pictures of their dogs, which were uploaded to Facebook. Associates, friends, and families were then asked to vote for their favorite dogs by donating to Doctors Without Borders, with every dollar donated counting as one vote. The 13 dogs receiving the highest number of votes will be featured in this year's calendar — one image for each of the 12 months and one for the cover. Doctors Without Borders/Médecins Sans Frontières (MSF) is an international independent medical humanitarian organization that delivers emergency aid to people affected by armed conflict, epidemics, malnutrition, natural disasters, and exclusion from health care in more than 72 countries. On any given day, more than 45,000 individuals representing dozens of nationalities can be found providing assistance to people caught in crises around the world. They are doctors, nurses, logistics experts, administrators, epidemiologists, laboratory technicians, mental health professionals, and others who work together in accordance with MSF's guiding principles of humanitarian action and medical ethics. MSF received the Nobel Peace Prize in 1999. 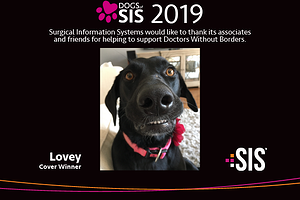 "We are pleased that the money raised through the Dogs of SIS calendar will support the efforts of those countless individuals working for Doctors Without Borders," said Doug Rempfer, SIS Chief Operations Officer. "They are making a difference in the lives of millions of people throughout the world in great need of assistance." SIS Cares started in January 2014 with "SIS Cares Day of Service," a single-day event where SIS associates volunteered at one of several charities in the Atlanta area, home to SIS headquarters. Now SIS associates have the opportunity to take one day off per year to volunteer at the charity of their choice. Previous annual SIS Cares holiday fundraisers have benefitted the Ronald McDonald House and numerous local charities in the cities where SIS offices are located. Since 1996, Surgical Information Systems ("SIS") has been dedicated to providing surgical care providers with the solutions and services they need to deliver improved operational, financial, and clinical outcomes. Focused exclusively on perioperative IT, SIS serves over 2900 facilities across the United States and Canada. SIS products and services include hospital and ASC-focused solutions for electronic medical records (EMRs), anesthesia documentation, business management, analytics, and revenue cycle management.